All transactions are safe and secure with a reliable history in online purchasing behind each of our associates. Buy the Hiro Sword t-shirt to own Heroes clothing and merchandise. Computer programmer Hiro Nakamura (Masi Oka) is convinced that he is a hero. Hailing from Tokyo, Hiro has the ability to teleport and manipulate the space-time continuum. He returns from the future to give the present version of himself a message, "Save the cheerleader, save the world." He is convinced that he can do so with the help of the other "special people," who, like himself, also possess unique abilities. Be like Ando and help support Hiro with one of these Heroes t-shirts, which are available in a variety of styles, including both men's and women's. 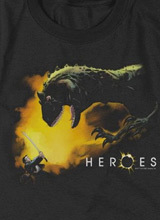 In addition to the Hiro Sword tee above, browse the Heroes Clothing Gallery for more apparel like men's and women's clothes, kids shirts or hoodies.